INDICATIONS AS AT 25 FEB 2005 : Management of anxiety disorders or for the short-term relief of the symptoms of anxiety. Anxiety associated with depression is also responsive to MURELAX therapy. Anxiety or tension associated with the stress of everyday life usually does not require treatment with an anxiolytic. The physician should periodically reassess the usefulness of the drug for the individual patient. Alcoholics with acute tremulousness, confusional state or anxiety associated with alcohol withdrawal are responsive to therapy. 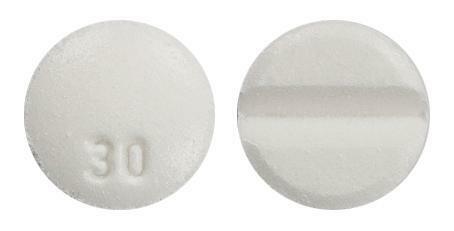 White, round tablet, one face convex embossed "30", opposite face flat with Ezi-split breakline. MURELAX is indicated for: 1. Management of anxiety disorders or for the short-term relief of the symptoms of anxiety. Anxiety associated with depression is also responsive to MURELAX therapy. Anxiety or tension associated with the stress of everyday life usually does not require treatment with an anxiolytic. The physician should periodically reassess the usefulness of the drug for the individual patient. 2. Alcoholics with acute tremulousness, confusional state or anxiety associated with alcohol withdrawal are responsive to therapy. Find out if tranquillisers are likely to help.